The Supreme Court on March 10 directed the Union Ministry of Health and Family Welfare to provide details of the families which have not received compensation for the death of or injury to their members during drug trials in the country. 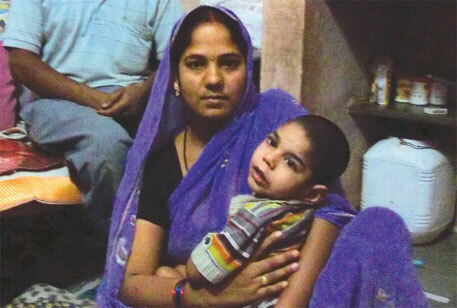 The apex court, which was hearing a case filed by Indore-based non-profit Swasthya Adhikar Manch, gave four weeks to the health ministry to respond. Over 2,600 people lost their lives during clinical trials for 475 new drugs between 2005 and 2012, according to an affidavit of the Centre. The apex court’s interventions have already prompted the health ministry to amend the Drugs and Cosmetics Rules, 1945, thrice in 2013. The ministry, in the three amendments, has specified guidelines on how to conduct ethical trials and set up an ethics committee to ensure that pharmaceutical companies follow ethical practices during drug trials. Pharmaceutical companies say the ammendments will hamper the growth of drug development in India. The industry says strict rules are delaying approvals and is forcing them to consider moving out of India for drug trials. 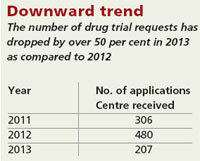 The Central Drug Standard Control Organisation, which is responsible for giving drug trial clearances, received only 207 applications in 2013, which is 50 per cent less than the applications received in 2012 (see ‘Downward trend’). Kiran Mazumdar-Shaw, chairperson and managing director of Biocon Ltd, India’s largest biotechnology firm, says her company is planning to shift drug trials of at least 10 drugs to other countries. “Policy makers are taking a long time to give approvals. Waiting for nine to 10 months is not possible,” Shaw told Down To Earth during a telephonic conversation. She says it is unfair that the entire industry is made to suffer because of unethical drug trials conducted by international non-profit PATH in 2010. PATH had conducted drug trials on tribal schoolgirls in Khammam district in Andhra Pradesh and Vadodara in Gujarat to test the vaccines of two US-based pharmaceutical companies. The trials were stopped following the death of seven girls. A parliamentary panel last year said representatives of the Indian Council of Medical Research “acted at the behest of PATH in promoting the interests of the vaccine manufacturers”. The panel report also said that the approvals by the Drug Controller-General of India for the trials “appear to be irregular”. Drug firms like Piramal, Dr Reddy’s and Sun Pharma, too, have said they will now carry out trials outside the country. However, health ministry officials deny the industry claim of delay in giving clearances for clinical trials. Jagdish Prasad, director general of health services, health ministry, says 45 drug trial licences were issued in February alone. Meanwhile, public health experts believe the announcements of pharma companies to move out of the country are a tactic to pressurise the health ministry to dilute drug trial rules. “The industry is trying to push the government to relax rules because conducting clinical trials in India is cheaper than in other countries,” says S Srinivasan of Vadodara-based drug manufacturing firm LOCOCST, which is fighting for access to affordable drugs in the country. Sarojini N of non-profit Sama Resource Group for Women and Health says civil society is not opposing clinical trials. “We want ethical conduct and fair compensation to the subjects,” she says. Aradhana Johri, secretary, department of pharmaceuticals, Ministry of Chemicals & Fertilisers, has called for a balanced approach. “Earlier, it was free for all. Now, after the Supreme Court’s intervention, it has become closed for all. There should be a system that checks unethical trials and allows ethical trials,” she says.